US Ryder Cup captain Davis Love admits he is yet to decide on his pairings with just one more practice day to go until Friday's opening foursomes. "I didn't go to bed until 0230 thinking about my team," he said on Wednesday. "If I had to think about their team I wouldn't get any sleep, because they're as strong as we are, and it's hard to figure out what they're going to do. "I have a feeling for some pairings, but no, I haven't really put the pencil to that yet." While Europe's captain Jose-Maria Olazabal has three of his foursomes pairings seemingly established and successful - Luke Donald and Sergio Garcia, Graeme McDowell and Rory McIlroy, Ian Poulter and Justin Rose - there is far less certainty in the American ranks. Tiger Woods is likely to be paired with Steve Stricker, while Phil Mickelson revealed that he would go out with debutant Keegan Bradley, but Love appears undecided about the remainder. "The way we've looked at is that if we threw the names in a hat and drew them out, our guys are all happy with each other," he said. "I don't think I can make them mad. They might not play well, they might go out and lose a match, but I can't make them unhappy because they would all be happy to play with each other." In Wednesday's practice rounds Jason Dufner went out with Zach Johnson, Matt Kuchar with Dustin Johnson, Bubba Watson with Webb Simpson and Jim Furyk with Brandt Snedeker. "I'm very, very competitive. People don't get that because I'm polite, but I'll tee it up on Friday and - whoever I'm teeing it up against - I'll try to beat their brains in as bad as I can," said Snedeker. Asked if he was concerned that he could make a mistake with his pairings that could cost the USA victory, Love answered, "Yes. If you put the wrong guys out there, what are you going to do? "How are you going to make up for it? If you put them out and it doesn't work, what's the back-up plan? "I caught myself yesterday watching them play and thinking about pairings and going, holy cow, I picked those two guys, you know? "Those two guys were rookies, and look how great they're playing out there. They were nervous, they were shocked at how many people were out there. "But it wasn't like they were so nervous that they couldn't hit it, or that they didn't play well or they didn't make a bunch of birdies." It was at times a surreal news conference from Love, who burst into tears at one point when discussing his team and spent much of it talking about the table-tennis matches his players have been enjoying at their base. "I told you, Bubba (Watson) and I are going to cry a lot," he said, his eyes welling. "We were both crying at the same table last night. "We've been shocked the last two nights. They (the players) play hard ping-pong matches early. We couldn't get them to go to the rules meeting because they were all playing ping-pong. "If we have an injury this week it'll probably be somebody stepping on a ping-pong ball because they're everywhere. "They gave them so many they don't even care - they have pockets full of them, and they just keep hitting them." Discussing the relaxed atmosphere he was trying to create, Love added: "We've got some unbelievably fast thoroughbreds here, and if you don't ever let them out in the pasture to kick their heels up and eat some grass, they're never going to run." Mickelson, his usual upbeat self in his own news conference, explained the downtime activities had a serious point. "Looking back, we have not played our best when we have focused on trying to win the Ryder Cup," said the veteran of eight previous competitions. "We've played our best when we've had fun, enjoyed each other's company, and enjoyed the competition, embraced the gallery and felt the momentum kind of like in 2008 with Zinger (Paul Azinger). "Tiger and I haven't had much success together on the course, but I will say that as partners on the pong table, we are delivering. "Although we didn't play well together in '04 (at Oakland Hills, where the pair lost both fourballs and foursomes together), put us together on that table and we are rocking it." Love, who took his team to a steakhouse for a dinner on Tuesday night, said he would be giving his players a number of special gifts this week, as is Ryder Cup tradition. "Zach (Johnson) is the only one that knows one of the gifts that's coming, because we hang around a lot together," said Love. "I just told him, 'I haven't given you anything dangerous yet. You know I'm going to have to give them something they can get hurt with.'" 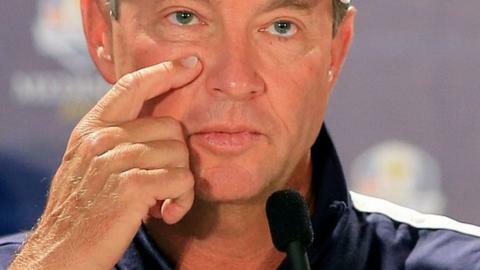 Love said he welcomed the pressure and expectation that comes with hosting a Ryder Cup. "It seems that every two years, everything doubles - the amount of people watching, the amount of cameras on the golf course, the amount of attention. "But I think Paul Azinger said it best: only under this kind of intensity can you have those great moments and those incredible shots. That's why the fans love it so much."